The cyl. is 25 inches center line to center line (retracted) at the tie rod ends. The threaded tie rod ends at 7/8 inch thick. The cyl is 2.75 inched thick. Not sure. It is NOS out of Mack. We had LJ, R and RD trucks. I can get you some dimensions if you are interested. Yes and the Leece-Neville type. I am not sure, but are here are pictures of the cylinders. 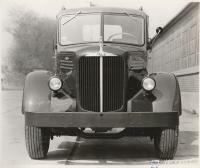 Hi, My father was a Mack engineer that owned a number of Mack trucks. Most of these parts are from the 1960's to the 1980's. The bulk of them are New Old Stock, that have been stored in a garage. Price are marked, you can make an offer on the total lot. Shipping worked case by case We are located in Newville, PA 17241. More pictures are available upon request. Most of the parts are listed below. If you have any questions, you can call my cell at 717-215-2814. Thanks, Les Mack Truck Parts: Description Model/Part Condition 2 MACK Robert Bosch Injection Pump, RQV300/600-105DPA, TA-Ep-G-320, Timed PC23BTDC. It is either new or a bench test one. ET2 673E NOS, $300.00 3 Leece-Neville Starter 24 volt, M001094119, NEW, This is not a rebuild, new from the mid 1980s 7580MC NOS, $100.00 4 Mack Model 221, 1960's Set (6) fuel injectors by American Bosch United Tech., Set for the American AKF-1006-2901A Reman and a American Bosch, United Tech. injection pump GM5450277C, 6BB000-4088-AL, 153624 PC, 313GC4118P1 84816 . It is new or reman from Bosch NOS, sold as a set, $500.00 17 Leece-Neville 12/24 volt, parallel switch, incomplete, type 4755 65-49 NOS, $10 21 Heavy Truck Muffler FOO-1938, 3.5" in/out, body 28" long FOO-1938 NOS, $35 22 Delco-Remy 12/24 Parallel switch, retails for $200 1119844 NO, $35.00 24 Bostrom Heavy Truck UOP Seat Tracks, New, from 1973 42288-011A NOS, $15 31 Leece Neville 12/24 Volt Parallel switch Serial 18678 S00147555A NOS, $25 37 Leece-Neville 14 volt 2600JB alternator 79000 Used, $30.00 38 BW Brake Pedals (2), NOS, from Mack 238983 NOS, $10 each 39 Robert Bosch injector Grab bag, 4 injector base, Governor body, misc parts, pump used $25.00 40 Mack L model Chrome "Mack" Hood word emblem (2) Used, $20 41 Delco-Remy Starter 12 volt 37-MT series, Type 300, NEW, This is not a rebuild, new from the mid 1980s. 1993756 NOS, $100.00 42 American Bosch New Injection Nozzles, 11 total (2) ADB 155M207-7 NOS (2) ADB 155M169.7 NOS, (2), E6-260 2VH ADB 160M 217.7 NOS (2) ADB 160M 215.7 NOS, (2) ADB 160M 229.7 NOS, Italy A Injection Nozzle NBM 770405 Used, $100 for the lot 55 Mack synchronizer clutch, think most of it is there, but never took one apart. Never used but taken a part. 320 KB 4350C NOS, $35.00 56 Power Steering Cly. Tag1349 C36563-1-1230 NOS, $75.00 57 1 gallon of Maxidyne Gold 312 SX 63-P2, $10, no shipping 58 R&U Model Operation Manual, 10/1974 (2) NOS 59 R&U Model Operation Manual, 1972 (2) NOS 60 R&U Model Operation Manual, 1/1977 (2) NOS 61 HMM Model Operation Manual, 5/1975 NOS 62 MB Model Operation Manual, 1974 NOS 63 RD Model Operation Manual, 1/1971 NOS 64 F&L Model Operation Manual, 1/1972 NOS 65 Maintence & Lubrication Manual 1/77 NOS 66 Mack Coin, 1900 to 1970, World Headquarters. 67 Cold Starting Aids (2) NOS, 30 for the pair.